Each year select a charity who we raise money for through a series of events. We aim to raise at least £1000 during the school year. This year through a democratic vote, parents and children selected to support Nightsafe, a local charity based in Blackburn. Nightsafe is a local homeless charity which provides services to homeless young people aged 16 to 24 in the local borough. Nightsafe offers young people a safe place to stay with resettlement support to help them find more permanent accommodation. They have helped countless young people by providing relief from the streets, given them meals and relies on volunteers and donations to carry out this work. 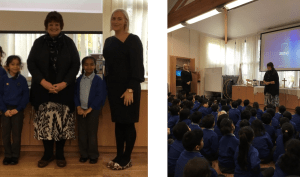 Chief Executive of Nighsafe Jan Larkin was invited to speak at our school assembly to highlight the work that Nightsafe do. She told the children how the money raised will go towards helping young people in Blackburn. Pictured are Chief Executive Jan Larkin with Deputy Headteacher Mrs Pfeiffer and members of our newly formed Ethos Committee. 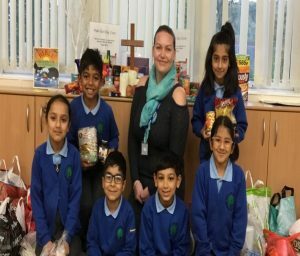 Harvest – Children donated food items and toiletries which were split between Blackburn Foodbank Oakenhurst Road and Nightsafe.